We’re glad to announce a new hardware designer has selected ReActiveMicro to help bring their project to the Community, and a big warm welcome to Fabien Bénattou! ReActiveMicro is now an Authorized Dealer and Partner with Fabien Bénattou in an effort to bring his first project to the Apple II Community. There may even be some collaborative projects in the future between the two hardware designers. We are always glad to help new designers and see their projects become more readily available. Fabien’s project is the Disk ][+, and offered in both assembled or as a kit. 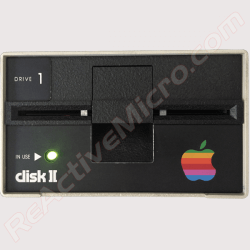 The Disk ][+ is a small PCB that installs into Apple Disk ][ drives. It replaces the red LED in the drives with a two-color LED, to better distinguish the reading phases, in green, from the writing phases, in red. Comes assembled or in kit form. It’s a great addition to your Applesauce! New Store Item: The Disk ][+ from Fabien Bénattou. Only $30 for the kit, and $40 for the assembled version!